My hair stylist says that my hair is fine textured and that I have a lot of it. While she has all of the skills to make my hair look its very best every time I go in for a color treatment or a trim, I am always finding it a challenge to get those same results at home. Recently I’ve been dealing with some extremely weird hair issues that I still never managed to quite figure out. Through a few Google searches, I learned that sometimes hair can retain too much moisture. I’m not sure if that is what I was dealing with, but let me try to explain the situation. For the past few weeks, I could never get my hair to dry all the way with my blow dryer. The end result looked as if I had over done putting in product after washing (note: at this point in my frustration, I had completely stopped using any kind of product). and made my hair look greasy and unwashed in the underneath sections. This also made it impossible to use my straightening iron as well, since my hair needed to be dry to use it. My frustration with my hair ended the day I used Davines LOVE Smoothing Shampoo & Conditioner for the first time. I immediately tossed out the two shampoos and conditioners I’d been using (one was a more expensive brand that costs about $30-40, and the other was a Smith’s grocery store brand). After just one use, my fine textured hair that had been feeling dry, course, and greasy all at the same time went through a brilliant transformation. I was able to get my hair all the way dry using my blow dryer, my frizz was reduced or non-existent, and the itchiness I had been experiencing with my scalp had also gone away after just several more days of use. Davines LOVE has exceeded all of my expectations. These unique formulas contain Indian fig extracts which help to heal the hair cuticles and add moisture back into the hair and the scalp. The thick and creamy conditioner has vitamin E as one of its ingredients, which is perfect for hair that has become damaged from over styling (I have to heat style every day, unfortunately.). Rice bran wax and borage oil are two other key ingredients that are nourishing and will help prevent any further issues with damaged hair and unhealthy scalps. The end result will be soft, manageable hair with shine and no static or frizz. Instead of dreading the hair washing routine, I now look forward to it, knowing I am going to get perfect results each and every time I step out of the shower. 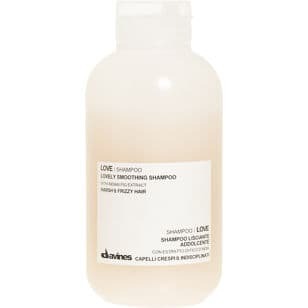 If you want your hair to look its very best, show it some love with Davines LOVE. This would be for me as I have fine hair. Thanks for this wonderfulm giveaway! I have never heard of this But, I would love to be the one to win! Does it still perform the same after you used the sample?